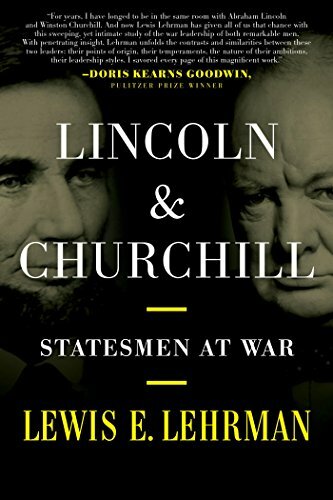 Lewis E. Lehrman, Lincoln and Churchill: Statesmen at War. Guilford, Connecticut: Stackpole Books, 2018, 544 pp., $34.95, Kindle $18.35. Lewis Lehrman, an accomplished historian, is also author of Lincoln at Peoria: The Turning Point (2008) and Churchill, Roosevelt, and Company (2017). Written for the general public, but of certain interest to scholars, Lincoln and Churchill is an intimate comparison of the two greatest democratic war leaders ever produced respectively by the United States and United Kingdom. The British historian Corelli Barnett offered chapters on both figures in his Leadership in War: From Lincoln to Churchill (2014). But Lehrman provides the first comparative book-length history of the two commanders. Each fought wars of national survival, setting heroic standards of leadership through mastery of their common language. Lehrman provides a sumptuous array of endnotes and selected bibliographies of the best Lincoln and Churchill scholarship, enhanced by commentary on the current work by distinguished living biographers, including Doris Kearns Goodwin, Michael Burlingame, Andrew Roberts, and Richard Langworth. His work is enhanced by a timeline of Lincoln’s and Churchill’s lives. He also provides more than three dozen photographs and cartoons. Of particular interest are the double chapter epigrams of well-chosen quotes. Among these I appreciated Lincoln’s: “It has long been a grave question whether any government, not too strong for the liberties of its peoples, can be strong enough to maintain its own existence” (292); and Churchill’s: “We will have no truce or parley with you, or the grisly gang who work your wicked will. You do your worst and we will do our best” (70). Lincoln and Churchill epitomized character and statecraft, driven by ambition, conviction, and commitment to victory. Both were public optimists who faced personal depression and time in the political wilderness. Neither was a practicing Christian, yet both felt the hand of Providence and displayed great personal courage. Unwilling to appease inhumanity, they tied ethical principles to public policy. Lincoln opposed slavery, Churchill totalitarianism. Both focused executive power to wage war and delegated other powers to a team of rivals. Both were inspired students of history, whose political experience was tested in public debate. Both had wit, intelligently using words as weapons, though Lincoln was more conciliatory to an enemy he hoped to rehabilitate. Churchill, by contrast, indulged his gift for invective towards an evil he intended to obliterate. Both men had key differences, too. They came from vastly different social backgrounds, with distinctive habits and temperaments. Lincoln had a more self-controlled ego and was a better listener, usually keeping his own counsel. Churchill was more visibly emotional and enjoyed a large entourage. Lincoln was more sensitive to the feelings of others and a better party leader. While Churchill was long famous when he took power, Lincoln was little known outside of Illinois. Churchill faced more enemies on a broader scale, but undervalued logistics and planning. Lincoln was more deliberate in making decisions while Churchill had a more opportunistic approach to strategy. Both had a revolving door of unsatisfactory generals until late in their respective conflicts. Lincoln, Lehrman believes, was a superior strategist to any general save Grant. Churchill, he writes, often bullied but never overruled his military chiefs of staff. Lehrman develops an intriguing comparative technique of tracing each leader’s war progress year by year. In 1862 and 1942, both were desperate for victory and facing domestic political criticism. In 1863 and 1943, both experienced serious illness while continuing to search for winning generals. 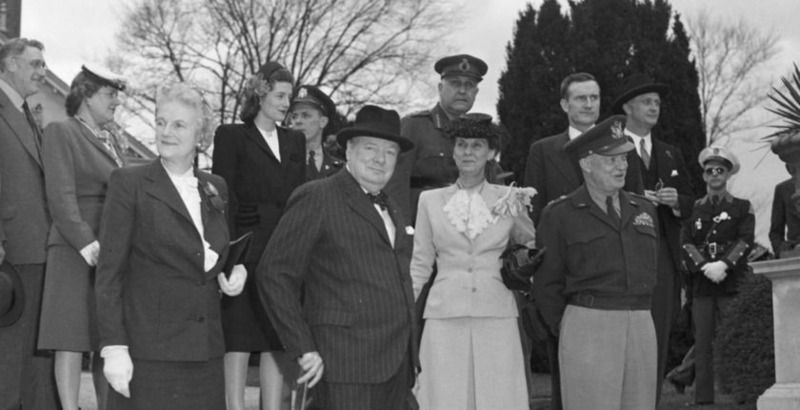 (Churchill, unlike Lincoln, had also to deal with increasingly difficult allies.) In 1864 and 1944, with winning strategies in place, Churchill’s power was waning, while Lincoln’s was waxing. In 1865 and 1945, both were magnanimous in victory, though both were aged and exhausted. After the war, Lincoln was more optimistic, with a generous reconstruction plan for the South. Churchill was more pessimistic, in the face of the growing Communist threat to Europe. …the death of Lincoln deprived the Union of the guiding hand which alone could have solved the problems of reconstruction and added to the triumph of armies those lasting victories which are gained over the hearts of men. 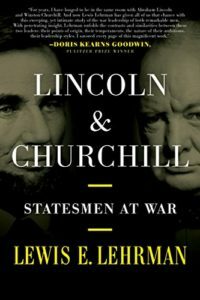 Lewis Lehrman writes well, argues logically, and provides a unique addition to the lavish roll of Lincoln and Churchill studies. His assessment of both figures is more balanced and sympathetic assessment than Barnett, who was perhaps not far enough removed from the Churchill era. Both agree Lincoln was a natural strategist who was patient with his generals. But Lehrman is far less willing to blame Churchill alone for early British defeats and does not try—as Barnett does—to exonerate the generals Churchill sacked. Above all, Lehrman has given us a finely crafted model template for comparative studies statesmanship: “In these two statesmen,” he writes, “the genius, the virtue, and the hope of the human race had expressed themselves so as to be studied, admired, and emulated for all time to come” (383). Mr. Shepherd is Associate Archivist of The Catholic University of America, and is the creator and principal writer for The Archivist’s Nook. He is also a frequent contributor to America’s Civil War and Military History magazines.